The name will make you smile and so will the flavor! 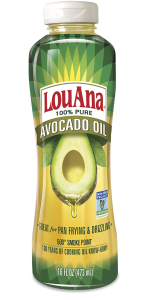 Pour LouAna Peanut Oil into a large deep fryer; heat to 350°F. Combine cornmeal, flour, 1 1/2 teaspoons salt and pepper in a shallow dish, stirring well. Dredge shrimp in cornmeal mixture. Fry shrimp at 350°F for 4 minutes or until done. Remove shrimp and drain well on paper towels. Combine remaining 1/2 teaspoon salt, mayonnaise, mustard, and juice, stirring well. Spread about 1 tablespoon mayonnaise mixture over cut sides of sandwich rolls. Place 1 lettuce leaf on the bottom half of each sandwich roll; top with 2 tomato slices. Season tomatoes with salt and pepper, if desired. Divide shrimp evenly among sandwiches; place top halves of sandwich rolls on each. Serve immediately.